For millions of readers, Tony Hillerman's novels have cast a brilliant light on to aspects of Western culture and landscape at once venerable and obscure. Here he has selected 20 stories by some of today's best suspense writers that illuminate every facet of today's West. From the chill of Alaska's interior to the sizzle of Death Valley, from the solitude of northern Minnesota to the misty reaches of the Oregon coast, every Western terrain is highlighted. And every Western subculture- whether an Arizona retiree's trailer park, an insular Texas cow town, or Las Vegas' high-voltage glitz--gets its due. Most memorable, though, are the people we meet in these pages: an old man with an ingeniously newfangled scam, an Eskimo woman who gives up her reclusive ways in search of a harsh justice, a small-town deejay whose big mouth becomes his undoing, an Anglo woman whose desire to understand another culture undoes her, and dozens more. Some are heroic, some are villainous, some are both, but every one will resonate with readers as a quintessentially Western character. 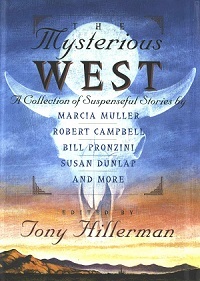 The unique volume gathers together the essence of what has made the American West a showcase for the best in contemporary suspense writing. For anyone drawn to the Western landscape and people, these deftly told, richly evoked tales make for must reading.